Micromax Superfone A80 features 3.6-inch TFT full-touchscreen display and is powered by 800MHz processor with 512MB RAM. It runs on Android 2.3.4 Gingerbread OS and the storage can be expanded up to 32GB via microSD card. The Superfone A80 sports 5MP rear camera with flash and 0.3 MP front-facing camera. It comes with a standard 2500mAh Li-ion battery which provides up to 7 hours of talk time and 288 hours of standby. Connectivity options of Superfone A80 includes GPRS, Edge, 3G, Bluetooth 3.0, Wi-Fi 802.11 b/g/n and USB 2.0. Other features includes long lasting battery, dual SIM (GSM + CDMA) phone, voice recognition tool AISHA, night vision setting, multi shot option, camera censor and multiple video recording formats. The Superfone A80 comes with a price tag of Rs 8490 INR. 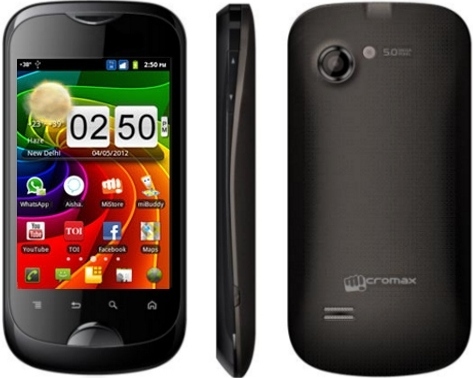 Tags:Micromax Superfone A80, Micromax Superfone A80 features, Micromax Superfone A80 specifications, Micromax Superfone A80 review, Micromax Superfone A80 details, Micromax Superfone A80 availability, Micromax Superfone A80 specs, Micromax Superfone A80 images, Micromax Superfone A80 pics, Micromax Superfone A80 pictures, Micromax Superfone A80 price.